Rado is synonymous with a pioneering use of high-tech ceramic in watches. Attractively sleek, the material is lightweight, hypoallergenic, and virtually scratchproof, making it perfectly suited to watchmaking. However, not so much for those of us who like our watches with a peppering of patina, and enjoy a little wabi-sabi action every now and again. 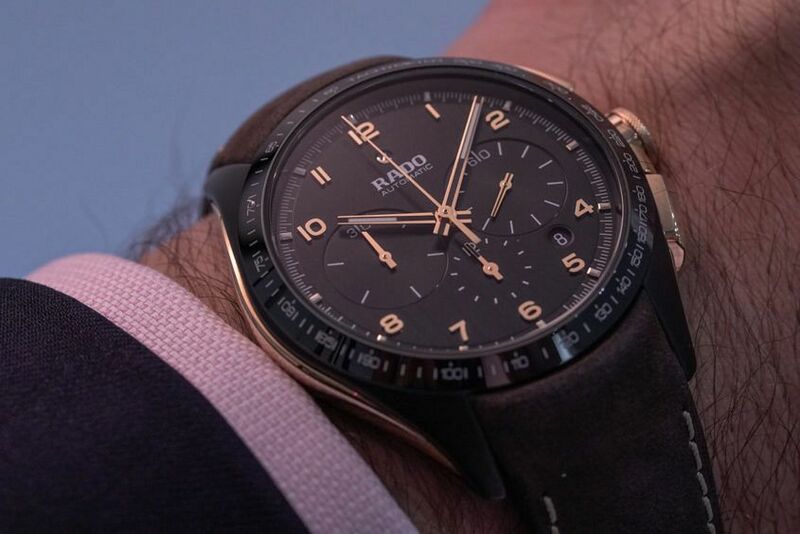 That’s where the brand new Rado HyperChrome Bronze comes in. Combining one of the most modern materials in watchmaking with the world’s oldest alloy. It’s an intriguing mix. This limited edition of Rado’s everyday HyperChrome chronograph retains its scratch-resistant ceramic, monobloc case. 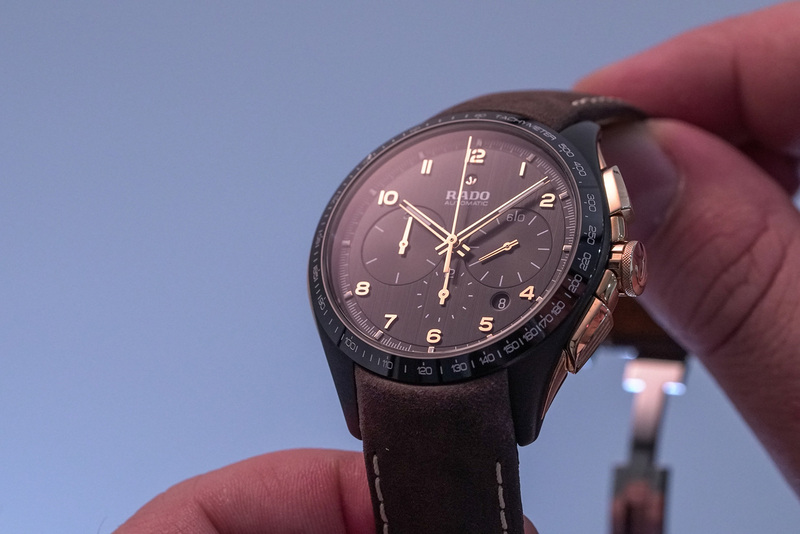 Only now it’s finished in a matt black, and then paired with side inserts that are constructed from a quick-to-patina bronze alloy – including the chronograph pushers and crown. Measuring 45mm across and 13mm thick, the case is water resistant to 100 metres, and features a polished black ceramic bezel printed with a tachymeter scale. While a curved sapphire crystal on the front gives view to the vertically brushed black dial, with rose gold applied indices and hands, and a three-register layout that shows the running seconds at three, chronograph minutes at nine, chronograph hours at six, and a discreet colour-matched date window tucked away at 4:30. 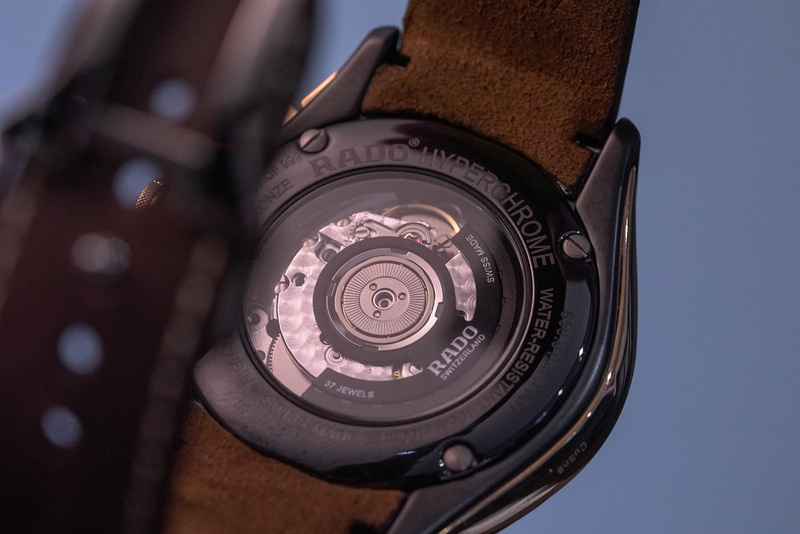 Flip it over, and a sapphire display case back shows off a decorated ETA 2894-2 movement, with a power reserve of 42 hours and an anchor-shaped black rotor. And a brown vintage-inspired leather strap attaches the HyperChrome Bronze to the wrist – instead of a familiar ceramic bracelet – with a polished black ceramic cover protecting its stainless steel extendable folding clasp. It feels a lot like previous versions of the HyperChrome chronograph. It’s large but lightweight, and wears deceptively smaller than you’d expect. What’s interesting, though, is the juxtaposition of new and old. And I suspect that as that bronze patina deepens so too will that interest. Like I said at the beginning, anyone who wears their battle scars with pride and doesn’t mind ageing gracefully. The use of bronze was a big surprise from the brand where ceramic reigns supreme. The two materials are polar opposites when it comes to their reason for being in watchmaking. But perhaps that’s what makes this pairing such a great fit. And I suspect it won’t be the last time we see bronze used by the high-tech material masters. The Bronze Age continues.